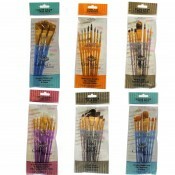 These reasonably-priced paint brushes are good quality and are ideal for beginners and students. 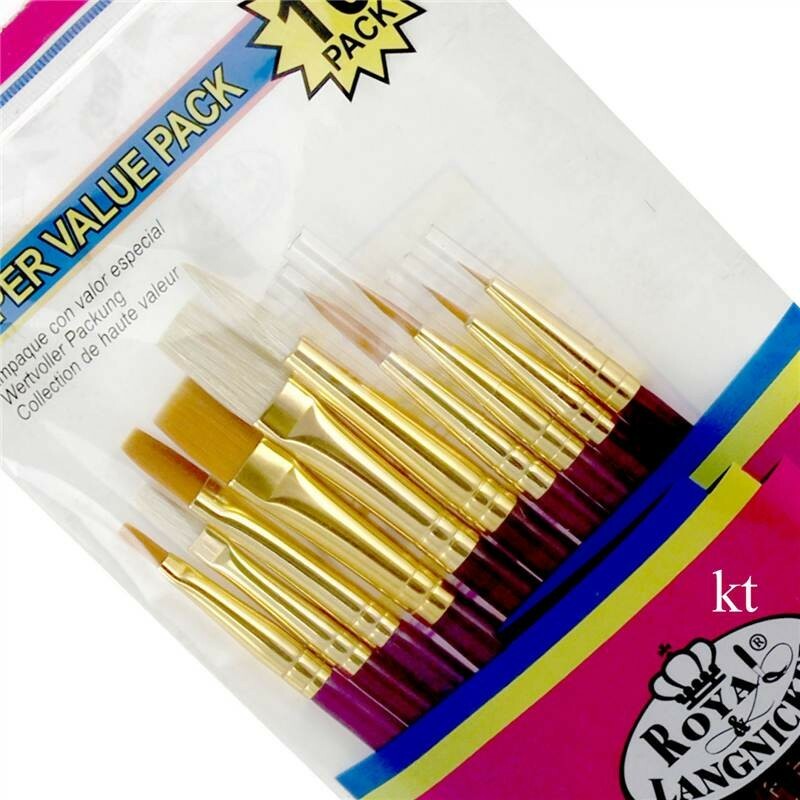 There are 10 Brushes in each pack. SVP1: Gold Taklon, Pointed Rounds 1, 3, 5, Detail Rounds 3/0, 2/0, 0, Flat 5/8", Shaders 2,6,10, Ideal for watercolour, Acrylic & Tempera. 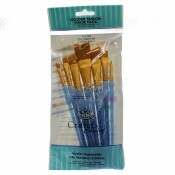 SVP2: Gold Taklon, Pointed Rounds: 1, 3, 5, Detail Rounds: 3/0, 2/0, 0, Flat: 5/8", Shaders: 2,6,10, Ideal for watercolour, Acrylic & Tempera. 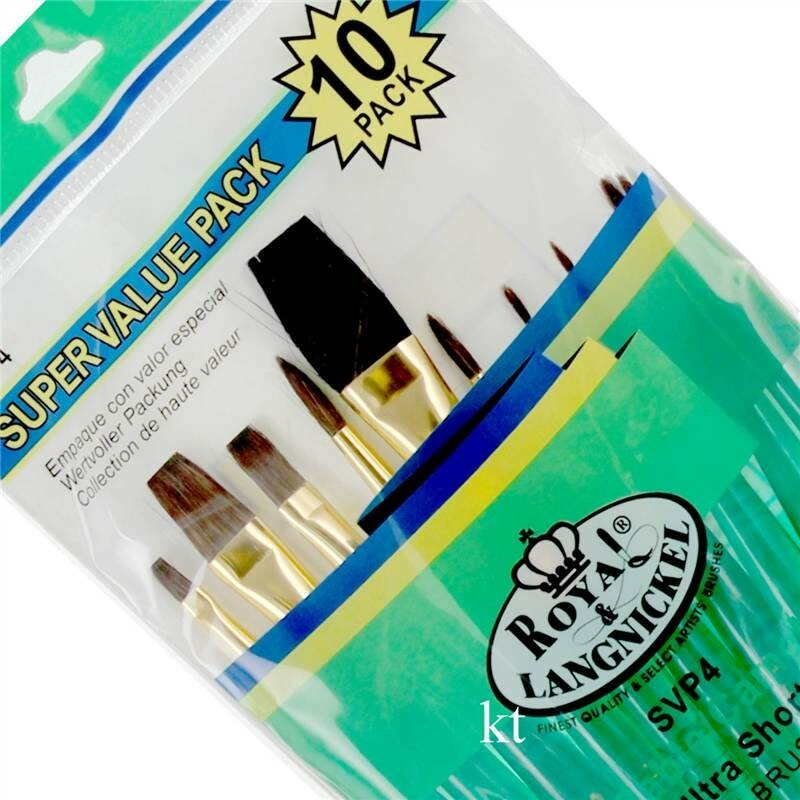 SVP3: Sable/ Camel, Detail rounds: 3/0, 2/0, 0, Flat: 5/8", Pointed Rounds:1, 3, 5, Shaders: 2, 6, 10, Ultra soft hair ideal for Watercolour artists because natural hair holds water on the brush superbly. SVP4: Sable/ Camel,Short Handle, Detail rounds: 3/0, 2/0, 0, Flat: 5/8", Pointed Rounds:1, 3, 5, Shaders: 2, 6, 10, Ultra soft hair ideal for Watercolour. 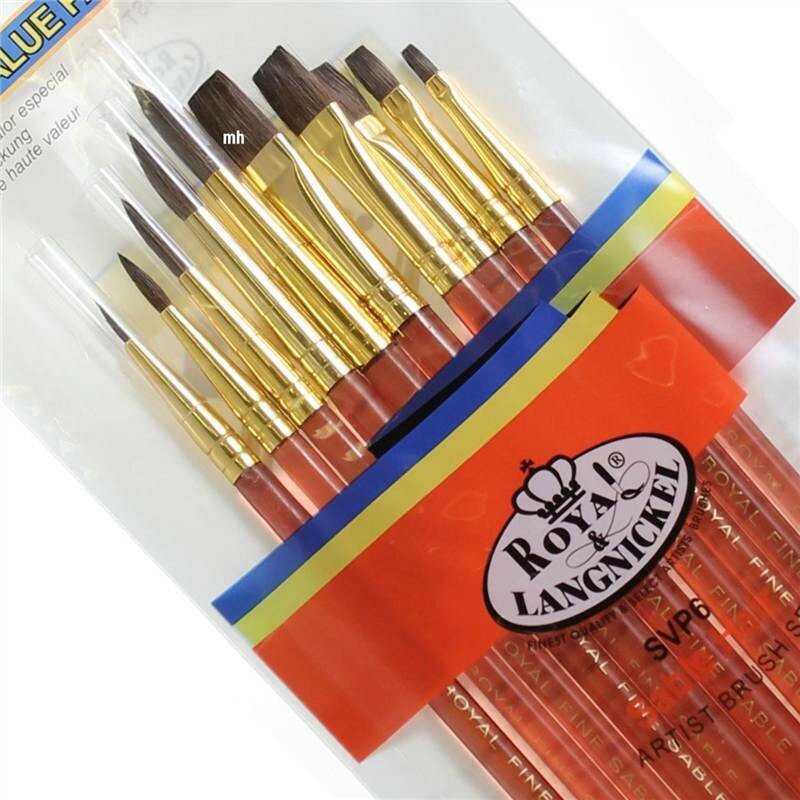 Suitable for a variety of painting styles and materials. 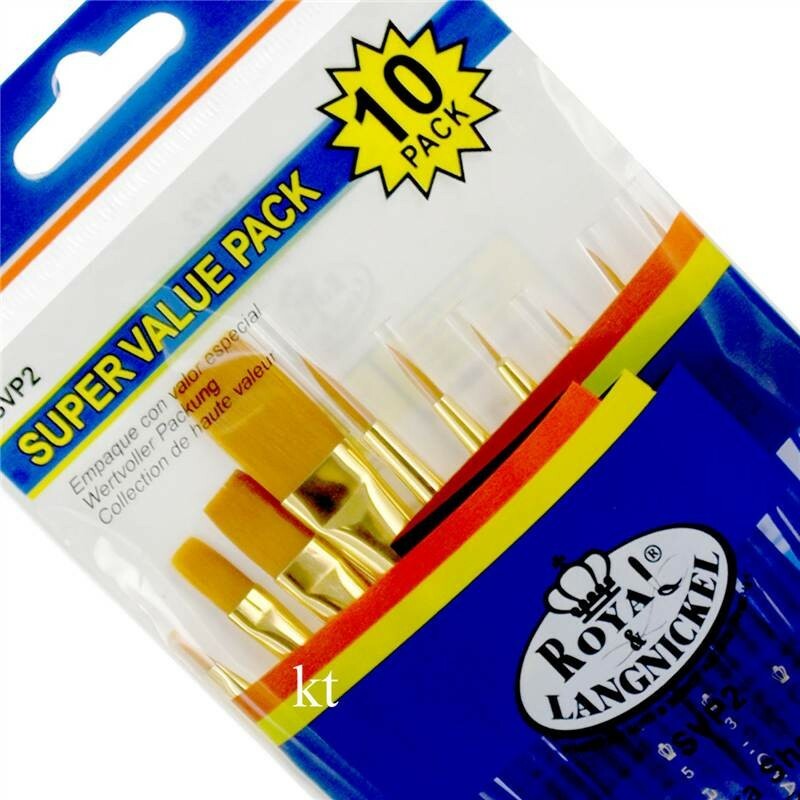 SVP5: White Bristle, Rounds: 1, 3, 5, 7, 9, Bristle Flat 1, 3, 5, 7, 9, Ideal for Acrylic and Oil painters, but can be used with any paint. SVP6: Sable, Shaders: 2, 4, 6, 8, 10, Pointed Rounds: 1, 3, 5, 7, 9, Mostly used by watercolour artists but can be used with any paint. SVP7: Gold Taklon, Shaders: 2, 4, 6, 8, 10, Pointed Rounds: 1, 3, 5, 7, 9, Use with any paint. good starter selection of brushes. SVP8: White Bristle & Gold Taklon, Round: 5, Bristle Flats: 2, 6, Shaders: 2, 6, 10, Pointed Rounds: 3/0, 1, 3, 5. 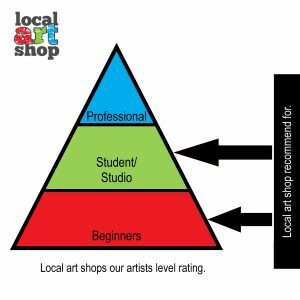 Use with any paint; popular with acrylic and oil painters. To qualify for buy 2 get 3rd free, all three items must added to the basket. Cheapest item free, mix and match any items that appear in Buy 2 get 3rd free section.